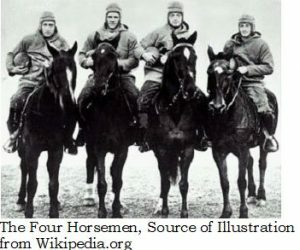 To improve the golfer’s game, the golfer must first know their ABC’s of golf to develop the four horsemen for distance and control. 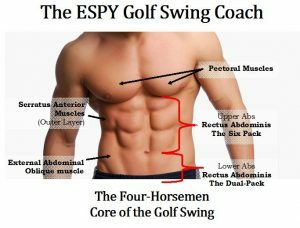 Developing a consistent golf game and lowering your handicap start with strengthening the abdominal pectoral muscles, or the golfer’s four horsemen. Strengthening the abdominal and pectoral muscles provides the golfer with the basic ABC’s of golf- Abdominal, Back, and Core Strength. Stronger abdominal and core muscles guard against lower and upper back injuries that can sideline a golfer and rob them of the ability to enjoy life, both on and off the course. The reason that I listed these four abdominal/core muscles is that they give the golfer the ability to search the websites, like Body Building, to find specific exercises to strengthen the muscles, the ABC’s of golf. NOTE: Some of the exercises on the Body Building website for the abs and core suggest using exercise machines. The golfer can rig-up exercise tubing with various resistances, like I have listed in the Golfer’s Trainer Home Gym. Lower back issues are the number one problem golfers have to deal with in their six. There’s unfortunately a list that is often all too long and too distinguished for both amateur and professional golfers that you know that had to deal with back issues that sidelined them. Back issues generally come in two varieties. The first is not properly using ergonomics to perform daily activities, and the second variety is the lack of strength, conditioning, and fitness training for the core and the abdominal muscles. The golfer exercising their abs and core muscles strengthens their six-pack muscles, shown below in the figure. I like to refer to this type of abdominal exercises as the 6-4-6. The golfer strengthening their six-pack muscles provides critical support for their six, or their back, thus the term Six-for-Six. 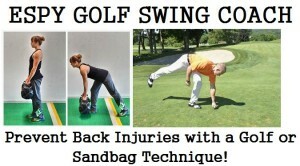 Your abdominal and core exercises have your six, or your back, and are the ABC’s of golf. There are many exercises the golfer can incorporate into their weekly workout program to strengthen their core and abs muscles. Some of these exercises include leg lifts, crunches, and working out with a punching bag. A great fitness motto the golfer needs to remember is 6-4-6 to improve the golfer’s swing mechanics to produce power and speed at impact. 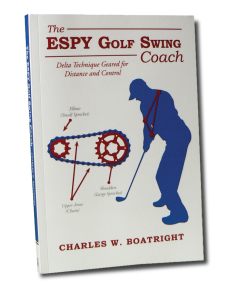 In Section 20 of my book, The ESPY Golf Swing Coach, is a weekly workout program that I follow, four or five times per week. This fitness program is called the CASPER (Cardiovascular, Aerobic, Strength, Plyometrics, Exercise Regimen) Workout Program. In my book and in my articles on my website under “The Locker Room,” I explain how the golfer can go about setting up their own golfer’s trainer home gym. The Golfer’s trainer home gym to develop the ABC’s of golf. 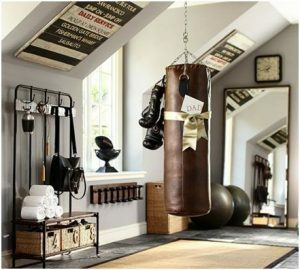 The reason I set up my own golfer’s trainer home gym in a spare room over my garage is very simple, for convenience. 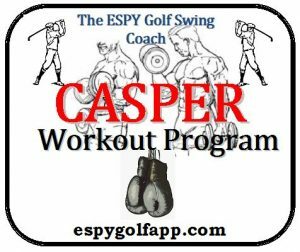 The CASPER is an entire body workout program, but it specifically targets the core muscles and especially the abdominal muscles, including the golfer’s six-pack. There are six muscles in the upper and two muscles in the lower regions of the abdominal muscles called the Rectus Abdominis muscles, as noted in the diagram above. 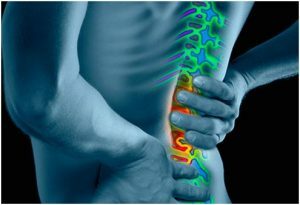 Exercising these muscles will help prevent the golfer from experiencing a herniated, bulging, or ruptured disc. A major component of my workout program includes working with a Medicine Ball and a chin-up bar. 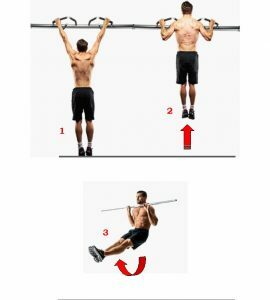 I use the chin-up bar to perform assisted chin-ups, Plyometrics leg lift combination. The chin-up Plyometrics leg lift exercise is shown in the figures below. Assisted chin-ups Plyometrics leg lift combination exercise. The assisted chin-up Plyometrics leg lift reduces the impact on your joints from a hard landing. The golfer gets the benefits of the thrust in their quad muscles of a Plyometric element, without the negative impact of a hard landing. This is key for me since I have had four knees surgeries and one hip replacement surgery. After the hip replacement, I have a new lease on life (See hip replacement). In addition to a workout program, the golfer needs to follow proper ergonomics procedures during the course of the day while bending and moving. One procedure, I refer to as One-step-forward pick up. You can’t bend at the waist if you take one-step-forward. It forces you to bend at the hips. NEVER BEND AT THE WAIST! This goes for your set up in the golf swing also. The other is a backward leg extension that the golfer can use to retrieve the golf ball out of the cup. These are small, but very effective means to ensure proper back fitness and health. Refer to the two images below of the One-step-forward pick up and backward leg extension techniques. 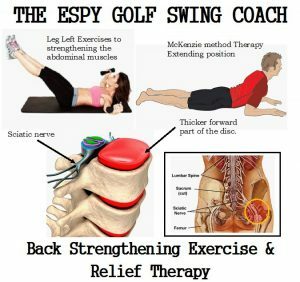 There is an additional procedure that the golfer can include in their exercise routine for additional back fitness and health, called the McKenzie Back Exercise, featured below. The golfer should also include yoga poses, such as the Warrior Pose 1 and 2. 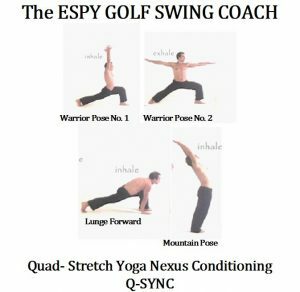 Both yoga poses are great for golfers to use during their weekly workout and to warm up before a round of golf. If you want to improve your golf game and your health and fitness, on and off the course, follow a well-planned workout program, including the ABC’s of golf. A good full body workout can take as little as 20-minutes per day, performed a minimum of three times per week. Now if a golfer is serious about improving their golf game, the golfer needs to trade in their golf glove and golf bag for a different type of glove and bag. 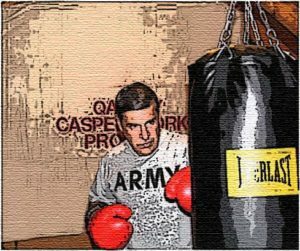 As part of my CASPER Workout Program, I have included two 3-minute rounds at the start and at the conclusion of my workout program. 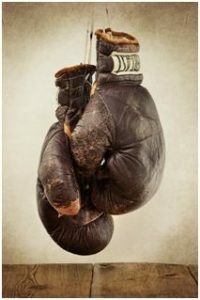 I also use the EVERLAST boxing gloves to get the proper feel to Synch and Preset my wristbands in my golf swing sequence. This procedure is detailed in my book. Please include exercise routine in your weekly schedule.